The hero of this first-in-a-series novel by Rob McCarthy derives its title from a poem by T. S. Eliot. 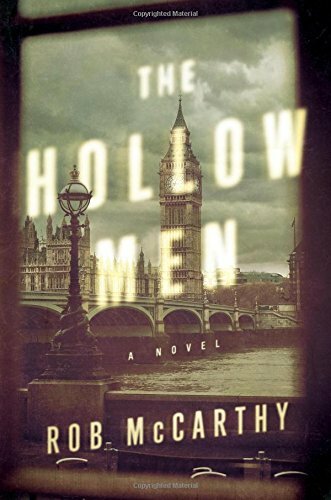 “Hollow men,” according to one of McCarthy’s characters, are individuals who have lost their souls to violence or causes and are desperate to fill the void. Enter the book’s protagonist Dr. Harry Kent, a former Army medic, now doing double duty as a doctor and police surgeon. Filling his void is a full-time job apparently. “Surgeon” is a bit of a misnomer used by London’s Metropolitan Police force because, in the opening pages, Harry finds himself dispatched to negotiate with a desperate teenager holding hostages inside a chicken shop. Harry, we’re told later by a friend, is a “hollow man” partially because of a wartime encounter in which his life was saved by his best friend Dr. James Lahiri. Harry repaid his best friend by “shagging” his wife, a betrayal that understandably weighs heavily on Harry’s mind. That bit of business, together with his own survivor’s guilt, has transformed Harry into a “hollow man” who is bent on saving his soul. With Harry’s far-from-perfect past established, the novel focuses on the present case at the hand: Who is trying to kill a teenage, HIV-positive addict? Despite the police ordering Harry not to investigate on his own, he does so anyway, and of course every one of his hunches or actions save the day. At least to this reader, Harry becomes an annoying know-it-all. The novel has plenty of action, almost too much. It is hard to believe that Harry is always so spot-on and far smarter than nearly every copper he comes across. Why doesn’t McCarthy dispense with the doctor setup and just make him a detective already? McCarthy reportedly is or was a fourth-year medical student himself and the novel reflects that although it’s questionable if that’s a good thing. There is a tremendous level of detail about medical procedures, which at times feels superfluous. Of course, the author throws in a female police love interest for Harry, but it feels very cookie cutter, as though someone advised the author he needed to appeal to female readers. She of course has her own demons—her superiors are out to get her!—and that too feels as though the author is piling on problems to give the character depth. The Hollow Men is satisfying as a quick read but as a series, it feels like it will get tiresome. When it comes to contemporary London crime procedurals, author Rob McCarthy has a long way to go to top the Cormoran Strike thrillers written by Robert Galbraith who of course is J. K. Rowling. Those books are anything but hollow; they’re filled with a delicious center.